A British clown (a man who makes a living as a clown, not just some guy I think is a "clown" who happens to be British) was quoted this week as saying that clients’ concerns about possible liability have seriously limited his clowning options. "Barney Baloney" told the Yorkshire Post that he was recently told by managers for a supermarket where he had been booked to appear that he could not make balloon animals for the children because one or more of them might be allergic to latex. He said that another venue had permitted him to use balloons, but told him he could not twist them into the shape of guns because that might encourage children to become violent. (Balloon swords were, for some reason, okay.) And he said that he had formerly used a bubble-making machine as part of his act, but had to stop because insurers said they would not cover him due to the risk that kids might slip and fall. "At this rate," he said, "I will have no act left. Things are going from crazy to ridiculous." Baloney did not explain how they got to crazy in the first place, though I assume they progressed from funny to zany to wacky to loony to crazy as they normally do. "This country is going crazy with its political correctness and health and safety issues and it’s making us a laughing stock," he continued, appearing to backtrack from his previous statement that things were already crazy and were in danger of becoming ridiculous. It was also difficult to tell from the report whether he was aware of the irony connected with Baloney the Clown’s expressing concern about being viewed as a laughing stock. The supermarket chain in question stuck by its no-latex policy, saying that it was indeed a health-and-safety issue. "We have banned balloons," said a spokesman for Tesco supermarkets, "because latex is used in the manufacture of them and this can trigger an allergic reaction in some children." That is potentially true, although latex allergies appear to be very uncommon. According to the British Association of Dermatologists (which seems to have embraced its unfortunate acronym, "BAD" — its website at www.bad.org.uk has a "BAD MEDIA SECTION" and a "BAD MEMBERS’ HELP SECTION"), the true rate is unknown but is probably significantly less than 1 percent. Truly serious reactions, called anaphylaxis, are even more rare and (again according to BAD) there have been only three fatalities ever attributed to latex allergies. It is a fact that many more people than that have actually been murdered by clowns. But then maybe we should target that much greater risk and just ban clownery altogether. There is also likely some risk of heart attacks among those who suffer from coulrophobia, something that I mention only as an excuse to bring up the fact that there is actually a name for the condition of having an abnormal or exaggerated fear of clowns. 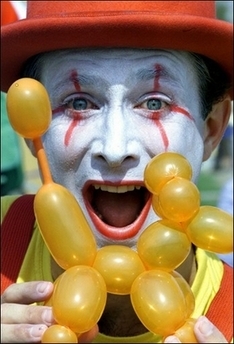 Whether or not the real but relatively low risk of balloon allergies or other clown-induced injuries justifies placing restrictions on Mr. Baloney and entertainers like him, I leave for others to decide.